NEW BRITAIN - The winter season has finally reached past the halfway point and as athletes are entering the final stretch, finishing strong is important regardless of how the season has unraveled. Newington’s Olivia St. Remy and Southington’s Shaun Wagner have played pivotal roles in the success of their teams in the past week. The Newington girls basketball team ended a three-game losing streak last Thursday as it defeated Platt 60-51. And while the Indians got plenty of quality performances along the way from a number of players, it was St. Remy who made all the difference. “All of our heads were in the game and we just came out aggressive,” she added. Olivia St. Remy scored 16 points on the night, helping Newington get that much closer to clinching a postseason berth. “Olivia has been an impact player for us since her freshman year,” Newington head coach Richard Bangs said. “Over the summer and daily during practices, she works on her offensive game and has become a lot more aggressive on the offensive end. The Southington wrestling team ended Saturday with a fourth-place finish thanks to senior Wagner. Wagner, the fifth seed in the 138-pound bracket, finished in first place. Wagner made sure to come out strong from the beginning. After pinning Berlin’s Jacob Sparks in just 1:06 in the first round, the senior won his next three matches by decision, including the final against Ponaganset’s Richard Andrews - the team that won the overall tournament - 11-3. And it wasn’t just the way he wrestled, but who he wrestled against that impressed his coach. Before making it to finals Wagner had to beat four competitors. 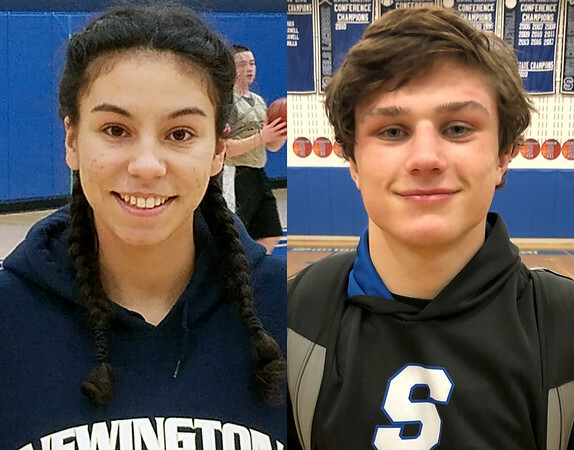 Posted in New Britain Herald, Athletes of the Week, Newington, Southington on Monday, 29 January 2018 22:32. Updated: Monday, 29 January 2018 22:34.